There has been a call for an urgent investigation into the shootings that occurred at the Lonmin mine in South Africa this Thursday. South African police began firing on a surging crowd of workers leaving many injured, bloody and possibly dead. Prior to the shooting the police attempted to disperse the crowd with water cannons and gas grenades. The mine, which is owned by Lonmin, was site to ten deaths over the weekend as a result of fighting between police and those on strike. In speaking to Fin24 Jackson Mthembu, the African National Congress spokesperson, said, "All of us feel very saddened by the violence we have seen on television. We are requesting that our government hold an inquiry on what happened today so that all of us South Africans can come to a conclusion on who is responsible." While the full extent of the shooting is unknown the New York Times reports 18 dead. The BBC reports that the police opened fire after miners wielding machetes refused to disarm. During the fighting the use of projectiles, assumed to be firebombs, were used against police who returned fire with a mix of live ammunition and rubber bullets. In speaking to Fin24 police minister Nathi Mthetha said that the police did all they could before shooting. "We had a situation where people who were armed to the teeth, attacked and killed others even police officers and, for the record, one of the firearms used was that of our deceased police officer." "The police threatened them with water from the water cannon, fired tear gas and stun grenades. And then in the commotion – we were about 800m (2,600ft) from the scene – we heard gunshots that lasted for about two minutes," said Molaole Monsthe of the South African news agency to the BBC. 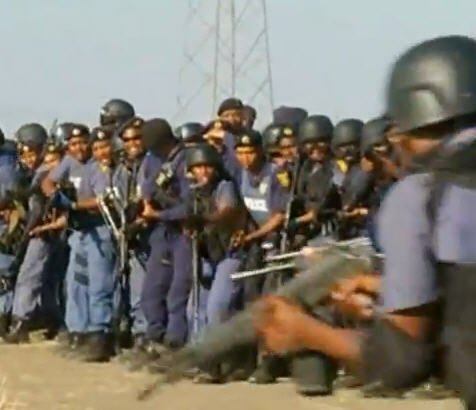 The shooting took place near Marikana, the third-largest platinum mine in the world. Lonmin mine has been ripe with unrest since August 10 when close to 3,000 workers initiated a strike over unjust pay. The Huffington post reports that ". . .amid the unrest, global platinum values rose more than $30 an ounce in trading Thursday while stock in Lonmin plunged 6.76 percent on the London Stock Exchange." MINING.com reported over the weekend on a previous clash between rival unions that left a nightshift policeman hacked to death at Lonmin's platinum mine in the North West province of South Africa.